“You search and investigate and pore over the Scriptures diligently, because you suppose and trust that you have eternal life through them. And these [very Scriptures] testify about me!” (John 5:39 Amplified Bible). 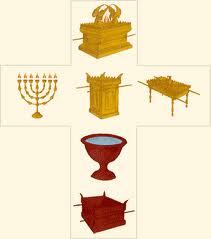 50 Chapters of your bible mention The Tabernacle; (13-Ex., 18-Lev., 13-Num., 2-Deut., 4-Heb.). Many other places in Scripture speak figurative language concerning the tabernacle. Why then, is the subject I am about to dive into, so overlooked and even insignificant in Christian circles today? So, I’ve decided it was time for the church to understand the pictorial of The Tabernacle; JESUS and the Cross. “And Jesus cried again with a loud voice and gave up His spirit. And at once the curtain of the sanctuary of the temple was torn in two from top to bottom…” (Matthew 27:50-51). If we don’t understand the meaning in Scripture of the holy of holies and the curtain or veil, we will miss out completely concerning exactly what Jesus Christ’s death meant to sinful mankind. “ALL Scripture is given by inspiration (God-breathed) of God…” The Bible is completely God-breathed. Each WORD is God-breathed. It was the view of JESUS when it came to the Father’s Word, the view of the apostles; then it must be our view too. This is the very Word of God; doesn’t just contain the Word of God, or point to religious experience. THIS IS THE WORD OF GOD! Is it any wonder that each and every detail and Word has spiritual significance about the TABERNACLE? The structure itself, its unique pieces of redemptive furniture shows great symbolism and typology found in them. Remember, everything was a finger-pointing to Messiah. Dr. J. Vernon McGee puts it this way: “The Tabernacle tells the story of God’s bared arm in action while creation tells out the account of His finger work.” God sent a picture before He sent the person. “For we are God’s (own) handiwork (His workmanship), recreated in Christ Jesus, [born anew] that we may do those good works, which God predestined (planned beforehand) for us [taking paths which He prepared ahead of time], that we should walk in them [living the good life which He prearranged and made ready for us to live]” (Ephesians 2:10 Amplified Bible). The Greek word for “workmanship” is poiema; poem or masterpiece. In the Old Testament, God’s masterpiece is the Tabernacle. Both are dwelling places of God for the particular age to which each belongs. Both reveal Christ; both are an adumbration, a foreshadow of His own glorious Person. The American Dream of yesteryear is still the same today. We all want to have our own dwelling place; a nice house to raise the family in. The framework has to be established first and then we will move in the furniture later on. But in God’s redemptive plans, the articles of furniture came first. These articles were the pictorial of the Person and work of Christ in redemption. And yet, no article of furniture was a picture or image of Him. The blueprints and patterns for the Tabernacle are given in the Book of Exodus chapters 25-40. The instructions are not accidental in Exodus for it is called The Book of Redemption. It opens in the gloom of slavery in Egypt and closes in the glory of the Tabernacle. “FOR SINCE the Law has merely a rude outline (foreshadowing) of good things to come–instead of fully expressing those things–it can never by offering the same sacrifices continually year after year make perfect those who approach [its altars]” (Hebrews 10:1 Amplified Bible). The Mosaic system served as one of the highway markers in pointing to Christ Jesus, and His cross; a place where God completely and finally worked out in His sufficiency and suffering a way back to Himself for man. Since the Tabernacle is but a shadow, a representation of the true Tabernacle in heaven (Revelation 15:5; 21:3). However, the Tabernacle where God is residing in heaven, certain articles of furniture are not present. Since Jesus is the once and for all sacrifice, the brazen altar would no longer be applicable. Also the bronze laver, and the table of shewbread will be missing, which I will address in a future blog on the Tabernacle furniture. “He went once for all into the [Holy of] Holies [of heaven], not by virtue of the blood of goats and calves [by which to make reconciliation between god and man], but His own blood, having found and secured a complete redemption (an everlasting release for us)” (Hebrews 9:12–Amplified bible). 3. The altar of incense. 4. The table of shewbread. 5. The lampstand of gold. 6. The laver of brass. 7. The altar of brass. 1. (2) Articles in the Holy of Holies: the ark and the mercy-seat. 2. (3) Articles in the Holy place: table of shewbread; lampstand of gold; altar of incense. 3. (2) Articles in the outer court: Altar of brass and the laver of brass. The first plan among the articles of furniture that God gave Moses, the ark and mercy-seat belonged together; the very center of God’s divine plan. When the ark was in its rightful place in Israel’s thinking there was a real blessing. Relegated to a secondary place, the blessing was withheld. The brazen altar was given last, together with the laver. Why would I start this whole discussion, regarding the articles of furniture in the reverse order that God gave His detailed instructions to Moses? God’s instructions were issued from His viewpoint while His habitation was in the Holy of Holies; looking out to the sinner on the outside. What a contrast this is with the Laodicean condition in Revelation 3:14-18 and in the present-day church; where Christ is apparently out of the church, found standing at the spiritual heart doors and knocking for an entrance. “Behold, I stand at the door and knock; if anyone hears My voice and opens the door, I will come in to him and will eat with him, and he [will eat] with Me” (Revelation 3:20). Under the Old Testament economy, the sinner had to make certain sacrifices; to get in to God, man did the knocking. Now the Lord Jesus stands outside of individual hearts and knocks. Then a sinner had to be brought to God. Now, God comes to the sinner. The brazen altar was sometimes called the table of the Lord or the altar of burnt offering. It stood at the very entrance of the Tabernacle [Exodus 40:29]. Specifications of constructing the brazen altar are found in Exodus 27. “And the priest shall burn all of it [a slain lamb] on the altar for a burnt offering, an offering by fire, a sweet and satisfying odor to the Lord” (Lev. 1:9). “And walk in love as Christ loved us and gave Himself up for us, a slain offering and sacrifice to God [for you, so that it became] a sweet fragrance” (Eph. 5:2). The offering of Christ of Himself in His glorious Person on the cross is called a “sweet fragrance” unto God. The brazen altar finds perfect fulfillment in the work of Jesus on the cross. In my next blog I will continue on with THE LAVER OF BRASS: THE DOCTRINE OF SANCTIFICATION as we move forward to the furniture in the Holy of Holies; the Ark and the Mercy Seat.